Memorial Plaque in the Mighty Eighth Air Force Heritage Museum, Savannah, GA.
2Lt Myron M. Goldman (CP-KIA) was a substitute CoPilot on 6 Feb 44 for regular CoPilot 2Lt James R. Burns. Lt Goldman was a new First Pilot flying with the Bass Crew on his combat orientation flight. He died in the stricken B-17. See: James Moffat Crew. Sgt Cyril J. Dockendorf (TG-POW) was a substitute crewman on 6 Feb 44 for regular Gunner Sgt Anthony Hendricks. (POW) 6 Feb 44 mission #106 to Dijon, France in B-17 #42-97498 Padded Cell II 358BS (VK-J). Went down with a fire in the cockpit. 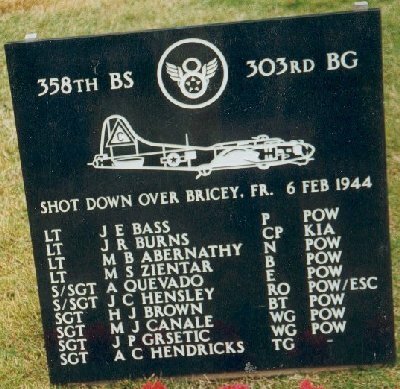 The B-17 crashed near Bricy, in the Paris, France area. Lt Julius E. Bass suffered from a broken left shoulder and facial bums. Two German Luftwaffe soldiers were waiting for him on his parachute landing. Arguments over custody were made between Luftwaffe men and SS soldiers who soon arrived. Custody remained with the Luftwaffe. One of the Luftwaffe Sergeants, who made the rescue and capture, was friendly and promised to write Lt Bass after the war. Correspondence and a close friendship developed after the war (See: It's a Small World, Charlie Brown). Lt Zientar was hit by exploding plane parts as he exited from the B-17 Lt Abernathy and S/Sgt Quevedo landed in a plowed field and were captured by Luftwaffe Cadets from a nearby airfield. 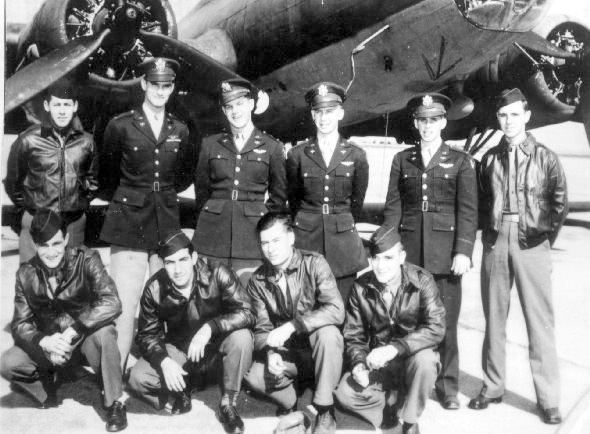 The 20 cadets took their prisoners past the downed B-17 and joined them up with the rest of the crew who had been captured. 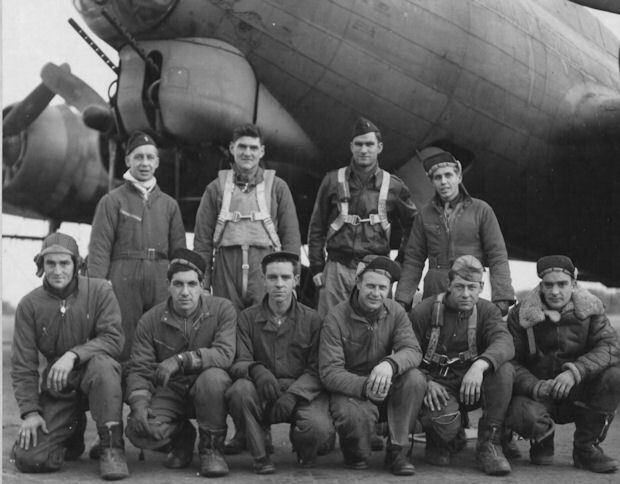 It's1300 Hours, Sunday, 06 February 1944, sixty miles-south of Paris, over Bricey, France and having just sold a brand spanking new B-17G (Burning, I might add) back to the taxpayers; I found myself floating down into the middle of the German airfield . . . continued . . .